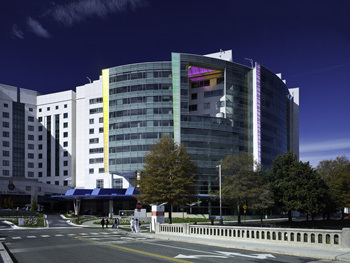 The Neonatal ICU at Levine Children’s Hospital in Charlotte is an 85 bed service with 53 Intensive Care and 32 Progressive Care beds. Every year, over 1000 patients are admitted and cared for by teams of Neonatologists, Nurse Practitioners and Pediatric Residents. The level 3-C service includes ECMO, High Frequency Ventilation, Nitric Oxide, and complete Cardiovascular care including surgery for congenital heart disease. A Total Body Cooling program is offered to infants with perinatal injury and evidence of Hypoxic-Ischemic Encephalopathy. Pediatric Surgeons are available 24 hours a day for emergencies and for repair of all forms of congenital defects. Subspecialty support from Neurology, Neurosurgery, Ophthalmology, Hematology/Oncology, Urology, Infectious Disease, Nephrology, Gastroenterology, Genetics, Orthopedics, ENT and Plastic Surgery is available around the clock. Consultation and coordination of prenatal services is provided with the 7 Maternal-Fetal Medicine specialists on staff. An active transport service helps provide care to patients in all counties of Region 3 and the northern counties of South Carolina adjacent to Region 3. The Neonatal Division of the Dept. of Pediatrics is the primary provider of resident teaching in newborn medicine. In addition, the Neonatal Division continues to provide core teaching for Nurse Practitioners, transport staff, and ECMO specialists. As a member of the Center for Pediatric Excellence at Levine Children’s Hospital, the Vermont Oxford Network, and PQCNC, the Neonatal Division is active in a growing number of Quality Improvement initiatives. Through the Center for Pediatric Excellence, new educational initiatives have begun to train housestaff, nursing and practitioners the basics of Quality Improvement. Learn more.